Psychologists, Social Workers, Counselors, MFTs & Addictions! Choose your course… by topic or discount package. Click your selected Course’s Title. Play Audio Download of Course Track free. Or read Transcript of Audio Course Track free. Read Course content Manual Free. Take online Test free. You get unlimited free Scoring of your Test answers. Track your account history of courses purchased. Download certificates at any time. Our objective is to provide you… the Social Worker, Psychologist, Marriage and Family Therapist, Counselor, or Addiction Counselor with continuing education courses. These Courses contain useable information to help you better meet your client’s needs. For this reason, all courses contain practical, how-to interventions with numerous case study examples. Do these CEU courses meet the requirements of your state licensing board? Select your state and profession above to view your Licensing Board's continuing education requirements. Get Social Worker, Psychologist, Marriage and Family Therapist, Counselor, or Addiction Counselor CEU's for license renewal. 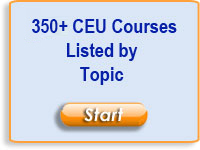 OnlineCECredit.com offers 250+ easy, fast, affordable CE courses to earn your Continuing Education Credit. We are an approved provider of CEU courses by APA, ASWB, NBCC, NAADAC, and various State Licensing Boards.